19/3/13 - Attribution - Centre des Monuments Nationaux, château de Cadillac - Attribution questions are often complex and require much caution. Thus, the one concerning the Austin painting, which Pierre Rosenberg (who had only seen it before the restoration) thinks can be given to Jacques Blanchard, a name which also occurred to us spontaneously, has not received unanimous agreement among specialists of the French 17th century who have now commented on it. Neither Guillaume Kazerouni, Moana Weil-Curiel, nor Sylvain Kerspern are convinced by the arguments but it is interesting to observe that although they place it rather in Vouet’s circle (as does the museum today), they all concur in associating it with a different artist. In yet another case, Sylvain Kerspern, on his website D’Histoire et d’Art, reattributed another work whose acquisition by the Centre des Monuments Nationaux we had recently announced here and which was given until now to Claude Vignon (ill. 1). The work, sold by the Mendes Galllery, was presented with this perfectly plausible attribution, but Sylvain Kerspern did not wholly recognize the style of this painter. 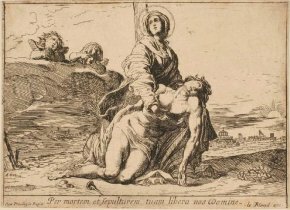 After further research, he found an engraving for which there is a replica in the Thuillier collection at the Musée des Beaux-Arts in Nancy, reproducing the central group though with several variations and clearly signed by Pierre Brébiette (ill. 2). We refer our readers therefore to his article which will help them to rediscover a painting by this artist whose work is being progressively reassembled and who, along with Vignon, but also other artists such as Jean de Saint-Igny and Juste d’Egmont, was part of a current of French painting in the first half of the 17th century, with a style qualified as "précieux".